I’d like to make these in my crockpot over Christmas. In a small glass, pour yeast into 1/2 cup warm water and stir together. Let sit 5-10 minutes, or until mixture is frothy. Combine 2 1/2 cups flour, yeast mixture and remaining warm water, maple syrup and salt in a large bowl or mixer. Mix until a shaggy dough comes together, gradually adding more flour until dough is smooth. Let dough rest 10 minutes, then turn out onto a lightly floured surface. For the filling: whisk together brown sugar, sugar, cinnamon and nutmeg in a small bowl and set aside. Roll dough out to a large rectangle of 1/8-inch thickness and trim off uneven edges. Brush melted butter over the dough, leaving a 1/4-inch border around the edges, then sprinkle cinnamon sugar mixture evenly over the butter. Take the long side of the dough and tightly roll it away from yourself to create a long log. Pinch the seam firmly so the edges stay together, then cut off a small piece from both sides so the edges are even. Cut roll into 8-10 equal pieces, line your slow cooker with aluminum foil, and place cinnamon buns swirl side up in the foil. Layer up two layers of paper towels and place them over the slow cooker. Put the lid on and turn slow cooker on HIGH. Cook for 1 1/2-2 hours.Note: begin checking rolls at 90 minutes to see if they’re still doughy or not. For the frosting: in a large bowl or mixer, cream together cream cheese, butter and vanilla extract until creamy. Alternate between adding powdered sugar and heavy cream until desired sweetness and consistency is reached. 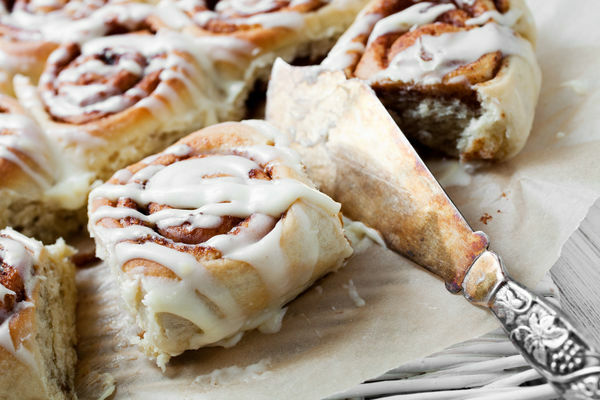 Extract aluminum foil from slow cooker and transfer cinnamon rolls to serving platter. Drizzle frosting over the top and enjoy!